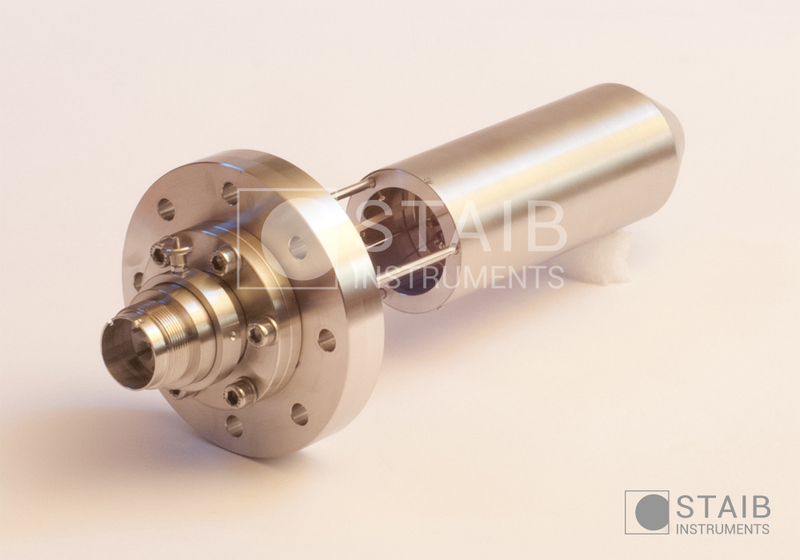 RHEED guns from STAIB Instruments provide unique electron optics systems for diffraction studies. RHEED-12 features full electrostatic electron optics and electrostatic beam deflection. The source is µ metal shielded. The unique design of STAIB’s electron sources has several advantages over the classic triode gun configuration. Beam blanking is one such advantage. The beam can be switched on and off electrically by controlling electron extraction from the filament. This method avoids the generation of stray electrons. The basic beam blanking option (standard on all STAIB RHEED systems), allows the beam to be turned on and off manually from the remote control box. Additionally a full beam blanking option is available. Here the electron beam can be turned on and off using a TTL type input through a BNC connector. The full beam blanking option can be used to keep the electron load on the sample very low. Electron bombardment of sensitive surfaces can be kept to a minimum. 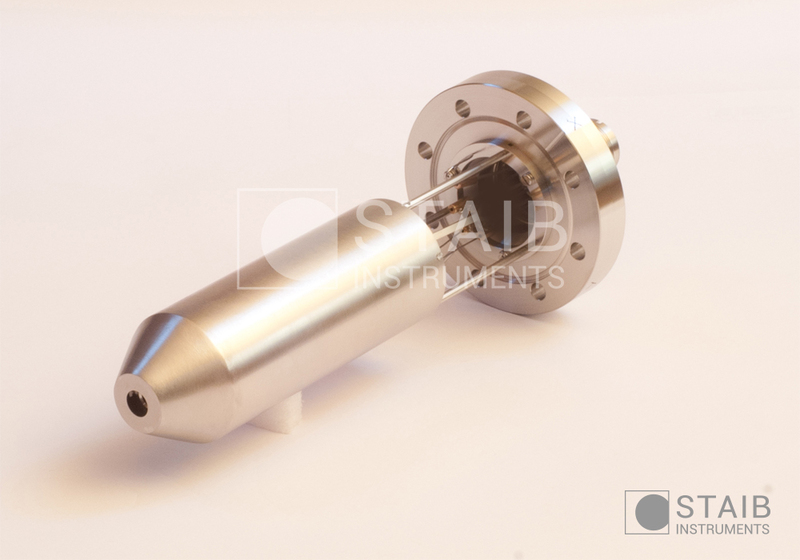 The blanking signal can also be triggered synchronously with external signals to improve the use of the electron source in the presence of stray magnetic fields by compensating their effect. The external trigger can also be utilized to synchronize with rotating samples, which is important for in situ monitoring in some deposition techniques. The computer control option for STAIB electron guns consists of two parts. The electron source power supply is equipped with an optional computer connection plug for use with analog control signals. The electron source system can either be operated using the manual control dials, or by using the optional computer control. The control voltages can either be provided by 3rd party software through a suitable DAC interface, or by the STAIB computer control module. The STAIB computer control option includes the cables and microprocessor interface to connect to the power supply computer control plug. 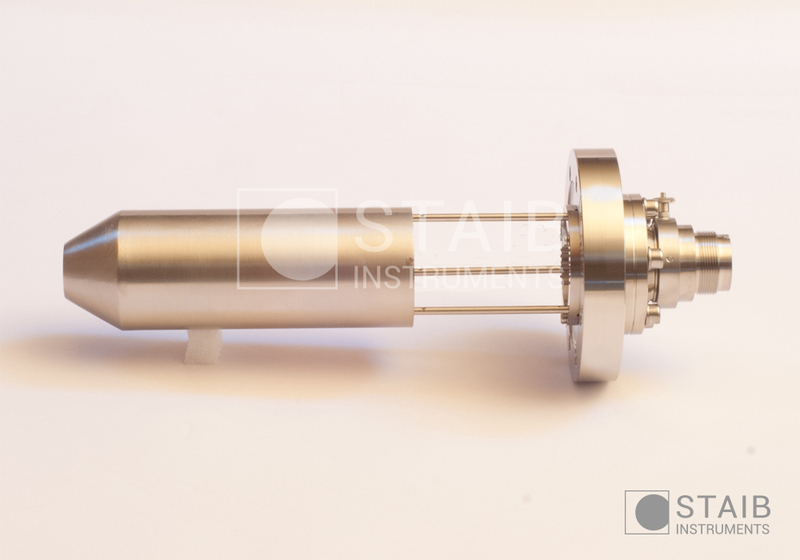 The STAIB software sends the input signals to the power supply to control the system functions. Full parameter sets can be stored, modified, and reused. The advanced version of the STAIB computer control module can retrieve and copy the adjusted values from the manual control dials, providing the user with previously unavailable ease of use. The option runs under the WindowsTM XP, WindowsTM 7, WindowsTM 10 operating systems, using a USB connection. RHEED computer control includes a microprocessor interface module and a software package, and makes use of the RHEED very precise and repeatable. User’s parameters can be saved and retrieved, the beam can be turned on and off using the beam blanking option, and the incidence angle can be adjusted using the optional beam rocking feature of the gun. Not all parameters can be reached simultaneously. Above specifications may change without notice. Pictures / diagrams for reference only.